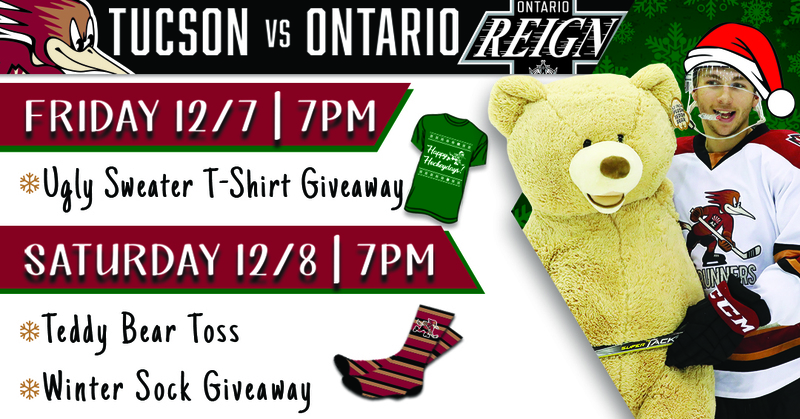 TUCSON, AZ – The Tucson Roadrunners, proud American Hockey League affiliate of the Arizona Coyotes, return to Tucson Arena next Friday, December 7 and Saturday, December 8 for a weekend series against the Ontario Reign filled with holiday promotions. Fans attending next Friday’s game will receive an Ugly Sweater T-Shirt Giveaway courtesy of Bank of the West upon entry at Tucson Arena. All attending are also encouraged to bring non-perishable canned goods for the Rotary Club of Oro Valley, who will be on hand and will be donating the items to IMPACT of Southern Arizona. IMPACT of Southern Arizona is a social service nonprofit that provides emergency services, strives to move people out of poverty, improve lives and inspire futures. Students still in need of tickets to the game can purchase the club’s College Night Package, which includes one (1) ticket, one (1) Roadrunners hat and two (2) drink vouchers all for just $25. Roadrunners Santa Packs, which include a family four (4) pack of tickets to Saturday’s game are on sale now for just $100. The package also includes a $20 food voucher and a professional photo with Santa. Saturday night is the Roadrunners third annual Teddy Bear Toss Game presented by iHeart Media, in which all attending are encouraged to bring a new plush or stuffed animal to throw onto the ice after the Roadrunners’ first goal. The toys will then be collected off the ice and given to Aviva Children’s Services, who will then donate them to Southern Arizona families in need this holiday season. Fans attending the game will also receive a pair of “Roadrunners Winter Socks” upon entry as a giveaway courtesy of Desert Diamond Casino. Roadrunners Holiday Packs, which include two (2) tickets to the Roadrunners game on Saturday, January 12th against the Chicago Wolves, American Hockey League affiliate of the Vegas Golden Knights, four (4) flex ticket vouchers and a limited edition Tucson Roadrunners bucket hat for just $150. The first 100 packs sold will receive two (2) passes to Lights of the World – A Holiday Wonderland Experience, featuring 45 stunning displays, over six million lights and free carnival rides at Kino Sports Complex until January 2. The Tucson Roadrunners remain in second place within the American Hockey League’s Pacific Division, riding a point streak of four straight games. The team will play in their fifth I-8 Border Rival matchup Wednesday night in San Diego, when they take on the Gulls, AHL affiliate of the Anaheim Ducks. Tucson forward Conor Garland was recalled by the Arizona Coyotes Monday morning and could make his NHL debut this week. The team’s leading scorer (Eight Goals, 11 Assists, 19 Points in 18 Games) has multiple points in seven games this season, including back-to-back in the team’s two most recent games against Ontario.